Eliza B. Good... No, Not Good, Great! We like customization. Actually, we won't lie. We LOVE customization. We love that little something extra that says, 'this is mine, this is me, I made this, I practically designed this' -- while in reality, you just bought it and chose from a list of simple alterations that give the illusion that you're receiving a mass produced product that has been made just for you. But that's not the case at Eliza B. in Essex. Try over 100 versions of fabric, 18 shades of leather, 15 types of trim, two heights of soles, and the option to add monograms in custom threading, and that's just for the Allez! Ballet flats, a new item to the brand. 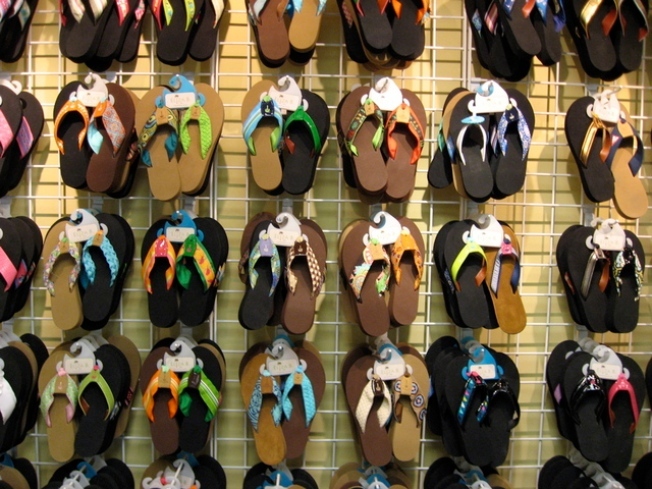 The options for their flip-flops, their most popular item, are truly endless. His daughters love for grosgrain ribbon changed the pace of business for Cecil Lyon, founder of Leather Man LTD - named after the legend of Connecticut lore. The former boat captain had been manufacturing needlepoint belts with lobster and key fobs with mallards since he purchased the company about 30 years ago, but one picky retailer demanded a feminine appeal -- and thus was born Eliza B. Not Eliza B. the young lady. No Eliza B. Lyon was already showcasing her favorite preppy striped inventions to her school pals, but it seemed appropriate for the collection to be named after her. Eliza and her father then began combining his years of expertise and her not-so-undercover market research in the minds of prep school girls to design a line that not only appealed to the young ladies in Lilly, but their mothers, and grandmothers, as well. We trekked over to Essex to meet with Miss Eliza and her fabulous father, Cecil, where we received a full tour of the Leather Man/Eliza B facility. We started in their showroom, featuring a sampling of their new Allez! Ballet Flats, where Eliza modeled a pair with a beveled low wedge sole made out of the black absorbent material as their flops. We were skeptical of the design at first but the wedge disappeared once worn, and the result was hidden height -- touché Eliza B! The factory itself is made up of three buildings on a campus off of Route 9 in Essex. But don't get us wrong, every product that Leather Man/Eliza B produces is made in small batches, with lots of love and care. We then visited the room of ribbons. And we mean Ribbons. More ribbons than we ever thought we'd encounter in our lives. From an impulse purchase - in the form of a boat - named the Little White Lie, to sororities and soccer teams, the ribbon pattern and embroidery team is fully open to suggestions. And breaking away from the grosgrain, Eliza B. also features braided madras, Turk's Head, patent leather, and most recently, fabric reminiscent of Mexican blankets and ponchos, that strangely - really works... and that's just naming a few. The second building is what they call the Sole Factory, obviously, where they give soles to the flats. ("Sole, not soul," joked Eliza.) Besides limitless customization, the sole of their shoes make the product even more unique. An Allez! has the same options of a black rubber or cushioned leather sole as the flip-flops. But within those flop options, lies the ability to change the firmness and height of the rubber, by pressing and layering different densities. Plus, you can add the super comfy Dr. Scholl's inserts into the leather, not to mention colors and custom trims. Finally, our favorite, of course, was the bag factory, where nautical flag totes and grosgrain-trimmed handbags are born. Hundreds of giant spools of brightly colored fabric and one seriously hard-working Palm Tree pumping embroidery machine not only cater to their footwear needs, but belts, wristwatch bands, headbands, dog collars, and trust us -- there's more. Then as all good tours, it ended in the gift shop, a Saturday-only retailer, run by the in-house staff themselves (including Eliza and Cecil) selling last season and overstocked flip-flops and accessories at discounted prices. So even though the season's over, Eliza B. and Cecil are just getting ready for two long seasons of trade shows, trunk show planning, and creating even more customization options to make our heads spin. But hey - we said we love customization, so bring it on! Find Eliza B. at their shop on Saturdays at 55 Plains Road in Essex, or call toll-free 1-800-243-6681 for a list of Connecticut retailers.